USGS scientists collecting water-qualty samples from observation wells above a subsurface groundwater contamination plume. Photo credit: Jared Trost, USGS. Research at a 1979 crude oil spill from a ruptured pipeline has exposed and helped to overcome many challenges facing an effective, cost-efficient cleanup of crude oil, U.S. Geological Survey (USGS) scientists have found. The environmental release of crude oil occurred near Bemidji, Minnesota. Although natural microbial activity has been degrading the plume of oil contaminants dissolved in groundwater, the crude oil trapped in the aquifer has provided a continuous source of dissolved hydrocarbon contamination to the groundwater contaminant plume. In 1998, persisting contamination prompted the pipeline company to install a dual-pump recovery system targeted at removing crude oil in the subsurface that was floating on and above the water table. Wells extending to 3 meters below the water table were installed and pumped to create a cone of depression on the water table that would collect and enable withdrawal of residual crude oil. 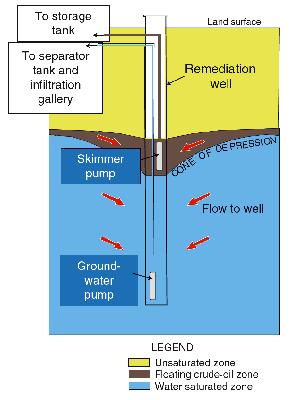 Crude oil was removed from each well using a pneumatic skimmer pump. The scientists had the opportunity to evaluate the performance of the remediation. They estimated that the remediation, which extended from 1999 to 2003, resulted in removal of about 115,000 liters of crude oil, 36 to 41 percent of the volume of oil (280,000 to 316,000 liters) estimated to be present in 1998. Crude-oil recovery system implemented at the Bemidji, Minnesota, research site, 1999 to 2003. The crude-oil in the unsaturated zone above the water table contained a mixture of crude oil, air, and water in the sediment pore spaces (Delin and Herkelrath, 2014). 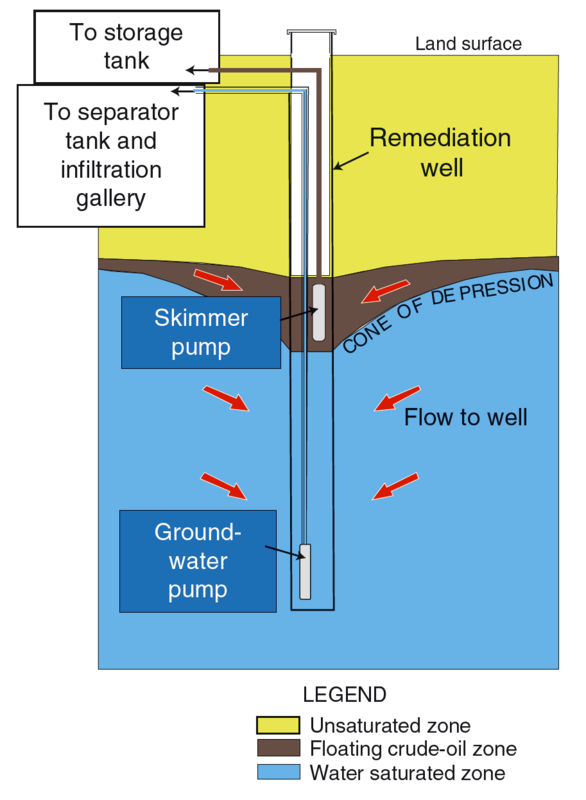 Remediation of crude oil from the aquifer is difficult, owing to sorption and entrapment of the oil in the pore spaces within sediments. Consequently, the oil-phase recovery was limited and considerable volumes of mobile and entrapped oil remain in the subsurface despite the remediation effort. The scientists also documented that management of wastes associated with the dual-pump recovery system is linked to expansion of the anoxic (oxygen deprived) zone of groundwater upgradient and beneath the existing contaminant plume. The simple, cost-efficient monitoring methods used in this study, which included measuring oil thicknesses in wells and dissolved oxygen concentrations in groundwater, provided an inexpensive approach to evaluating the efficacy of the remediation. In 2003, it was estimated that the United States has more than 240,000 kilometers (km) of oil pipeline. In 2011, the total amount of oil released annually was estimated at about 111,000 liters per 1,600 km of pipeline. Developing effective approaches for managing and remediating crude oil spills remains an essential precaution. This USGS Toxic Substances Hydrology Program research site is the only study site in the world tracking the long-term effects of a crude oil spill from a ruptured pipeline. Research at the site increases scientific understanding of the controls on the timeframe for the remediation and natural attenuation of petroleum hydrocarbons in the subsurface. This research was supported by the USGS Toxic Substances Hydrology Program and the Hydrologic Research and Development Program. Delin, G.N., and Herkelrath, W.N., 2014, Effects of dual-pump crude oil recovery system, Bemidji, Minnesota, USA: Ground Water Monitoring and Remediation, v. 34, no. 1, p. 57-67, doi:10.1111/gwmr.12040.